I have immersed myself in ecology since joining EcoNorth in June. I have undertaken numerous bat surveys on some of the region’s very impressive buildings. I took the opportunity to fly a Harris Hawk through the woods, handling a hawk for the first time. Keeping with my coastal connections, I had the opportunity to charter a boat from Seahouses to the Farne Islands, as part of a group of keen open water swimmers. This was a fantastic opportunity to swim with seals in their natural environment. The seals were very inquisitive and keen to swim up close for a better look, much to our delight. 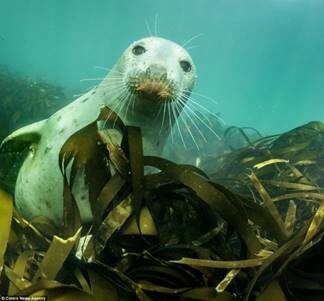 One of the group captured a fantastic underwater video showing how cheeky seals can be. The epic adventure was perfectly finished off with local fish and chips. If you ever need a marine mammal survey, EcoNorth has the capabilities and depth of knowledge to assist you. For more information, please do not hesitate to get in touch.